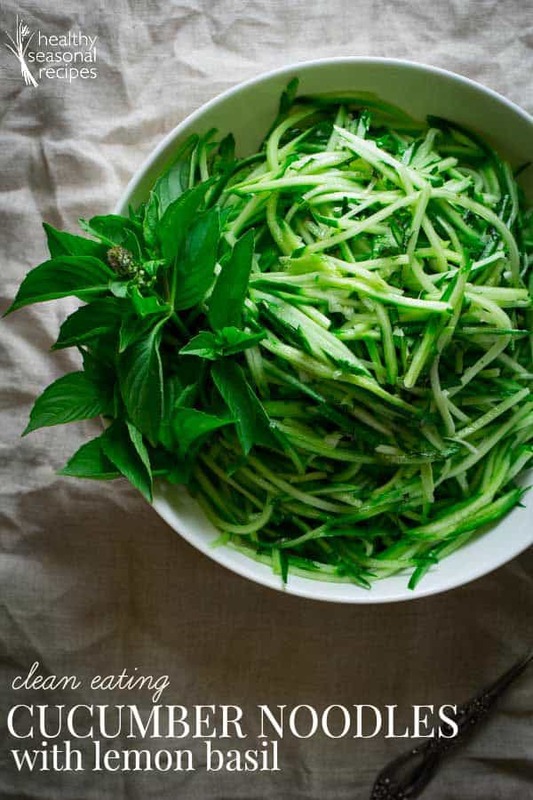 This clean eating salad made with cucumber noodles with lemon basil takes just 10 minutes to make. It is low-carb, paleo and vegan. If you had asked me three weeks ago if I was having a good year of vegetable gardening, I would have given you a much different answer than today. I am only in my third year of growing my own vegetables and so far I have been feeling pretty much like I have a black thumb. Even though I amended the heck out of my soil last fall and this spring with many arm busting trips of the wheelbarrow, I had a pretty dismal start to the season. The rainy-day-after-rainy-day-early-season really made it seem like it was another doomed year for sure. I was starting to feel guilty that Jase had taken the time to reinforce the fence with screening this past May. Was it even worth it? But all of a sudden things changed for the better. I can’t believe it, but somehow the summer of 2015 has become my best year yet! The reinforced fence has been hugely successful at keeping Mr. Bunny from eating everything in site. That said, there was a chipmunk nibbling at the baby zucchini plant this July. Thank goodness I had the wherewithal to pick them off the stems, and the plant (even with mildewed leaves) has quickly made up for lost time and busted forth with about 8 pounds of new zucchini. And there are more blossoms on the way! I was also sure that the basil was doomed this summer. I planted the seeds too early in the season and was positive it wouldn’t germinate correctly. Much to my surprise, all of it came up and now it is going bonkers! And there is so much of it. I planted a whole row of Renee’s Garden Scented Basil Trio and another swath of Italian Pesto Basil. With it all going so well now I am considering opening up a wholesale pesto business. And if pesto doesn’t sell then I could easily go into the cornichon business. After only growing two cucumbers last year, I went a little whack-o and planted nine cucumber plants. Ohhh boy, you guys I am scared to be honest. Seriously I could make jars and jars of cornichons right now. Every vine is covered in tiny 1-inch long baby cucumbers. And there are three different varieties. I have already harvested baskets full of full-sized cukes. But when the bulk of the crop grows to full maturity, I am in big trouble. This past weekend we went to my in-laws for a visit, and I tried to not sound desparate when I asked if I could bring cucumbers for our dinner. I busted out my mandoline and made this cucumber noodle salad in about 10 minutes. The best part was the thinly sliced lemon basil (plucked from the row of scented basil trio.) It made it seem much more complicated than it was and tasted so fresh and delicious. And my father in law even ate seconds, which I consider a high-honor indeed! 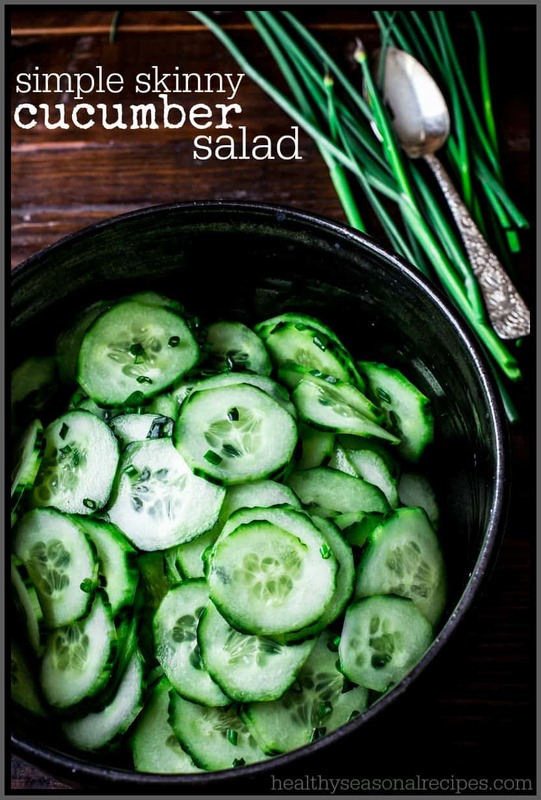 Don’t miss this Ultimate Guide to Cucumbers! 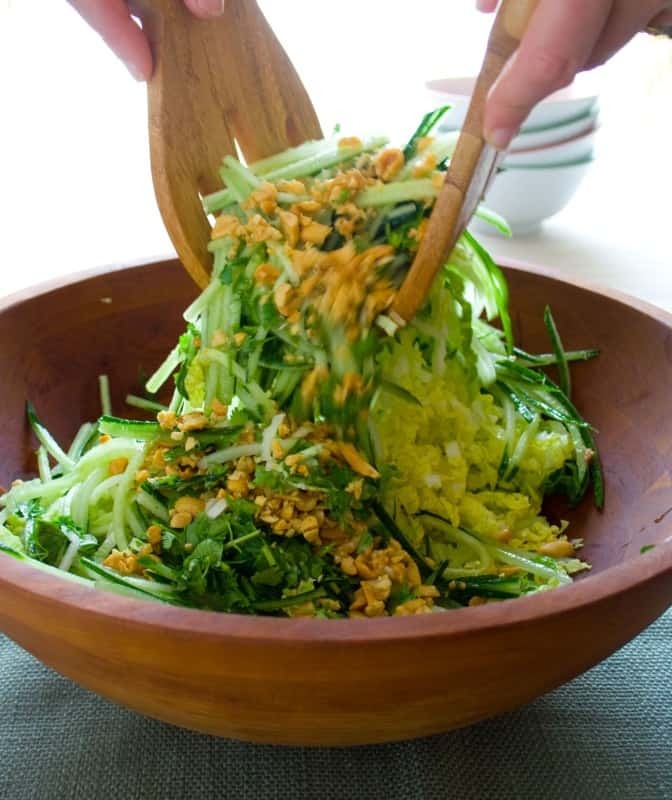 This clean eating salad made with cucumber cut into noodles with lemon basil takes just 10 minutes to make. It is low-carb, paleo and vegan. Whisk shallot, vinegar, oil and salt in a large bowl. Add cucumber and basil and toss to coat. Serve immediately. 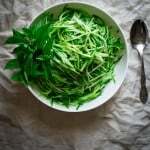 Tip* Chiffonade is a culinary term for a type of knife cut. It means to cut into thin ribbon-like strips. I have written more on knife cuts here. Thanks Rachel. We love them when they are cut up this way. 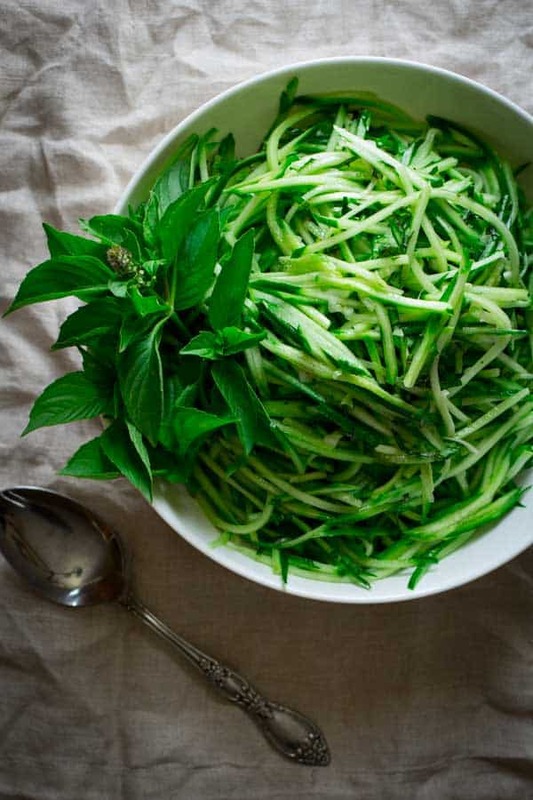 Cucumber noodles….Okay this sounds so delicious as an appetiser! Yes, it really is refreshing. Glad that comes across. Have a good one Catherine. 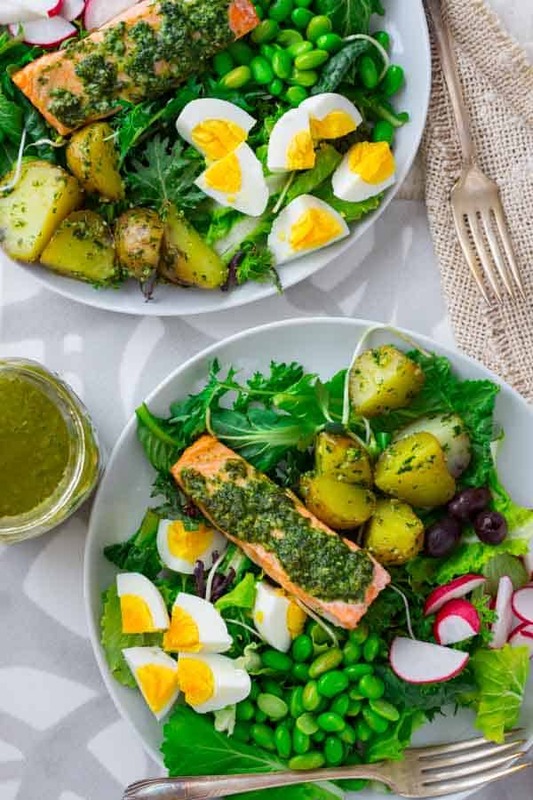 So glad to hear your garden is doing well and all that rain didn’t muddle things up – because if it had, then I wouldn’t see this gorgeous, fresh salad! Thanks so much Liz. Hope you enjoy the cukes! WOW! This looks amazing! What a great recipe! I love it!! …so healthy and nourishing! …also, I love all your cucumber recipes! YUM! 🙂 They look amazing!! Thank you so much Cailee! So glad you came by. Have a great day. 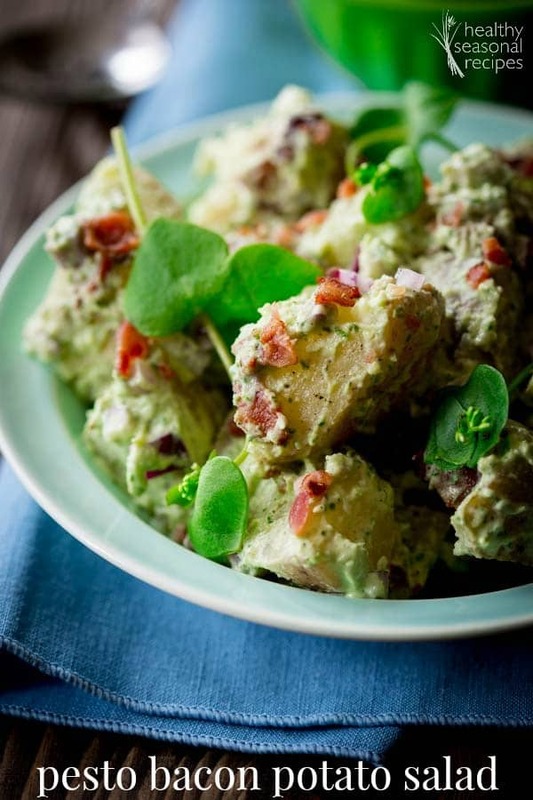 I just love all these fresh beautiful veggie recipes you’ve been sharing! The simple beauty is so perfect to highlight the wonderful produce! I can’t resist at this time of the year, and with a name like Healthy Seasonal I kinda feel like it’s expected, so there you have it. Ha ha. Thanks for coming by today Rebecca. Thanks so much Beverley. I just crave green veggies sometimes! 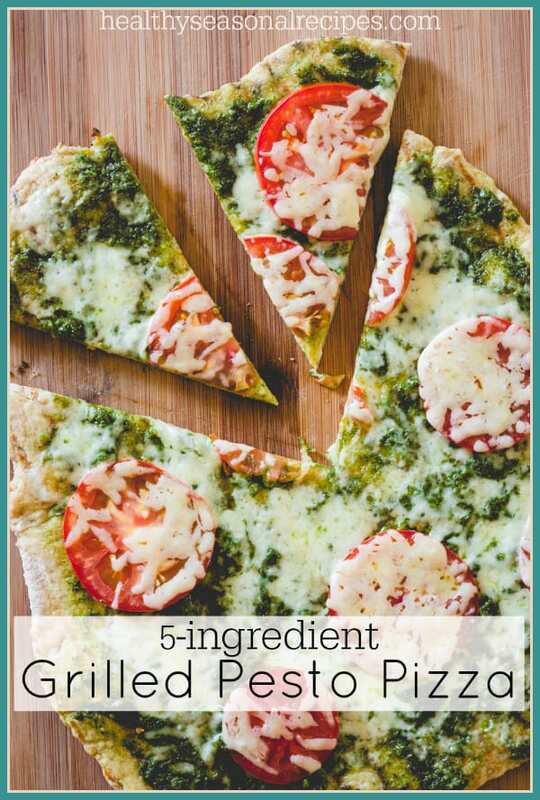 I love how easy this is to make and how light and healthy it is. The perfect lunch! Thanks so much Julia! So glad you came by. Have a great day. 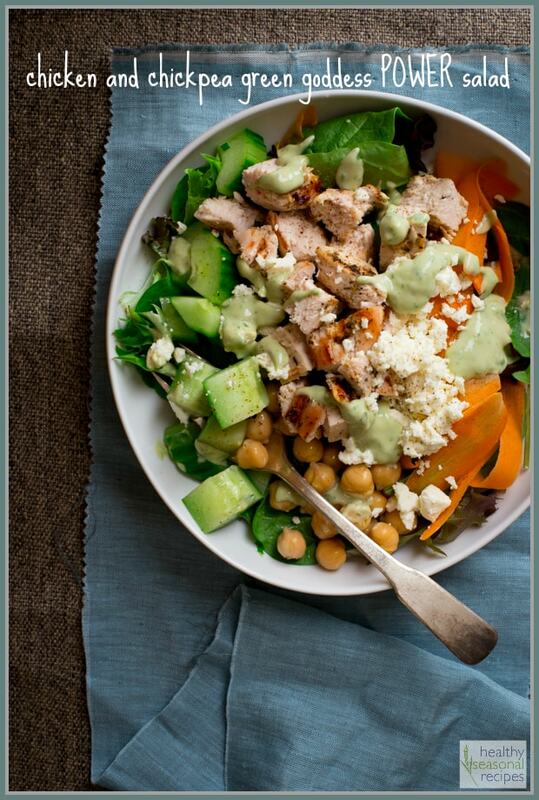 This dish looks like something my taste buds would 100% approve of! For sure! Glad you like it GiGi. 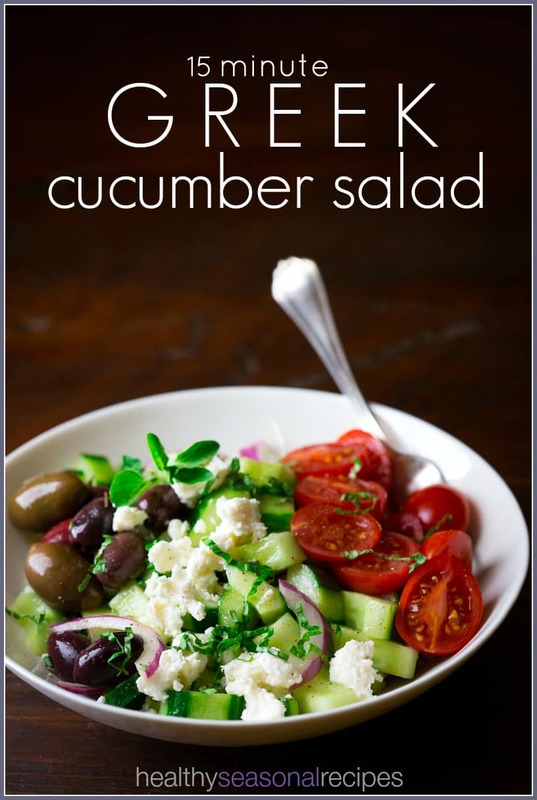 This sounds so deliciously light and tasty! I’m wondering about the lemon basil though….I’ve never seen that. 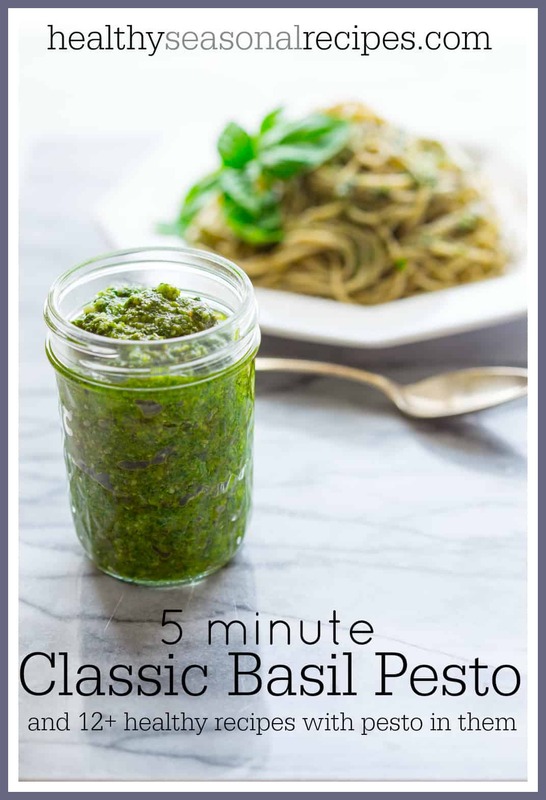 If it’s not available at my local grocery, is there a way to use regular basil and still add the lemony flavor? Thanks so much for asking, as I am sure other readers have the same question. I haven’t tested, so I can’t say for sure. But, I think what I would try is to whisk 1 teaspoon fresh lemon zest into the dressing. Then use 1/3 regular basil in place of the lemon basil. We eat a lot of cucumbers,but never in my wildest dream did I imagine it would come out as inviting as this: cucumber noodles! we Will definitely try this! Thanks!